It's very minimalist, stripped down, clean. Admittedly the icons needed a second look to identify; the circled question mark is clear enough, but the shopping basket was a bit... airport terminal abstract signage. And the community as a goldfish bowl? At least, I see it as a goldfish bowl. They are clever, but maybe a bit too abstract. I like them - as long as I have the text labels to tell me what they are. My problem with those links is that they take you to three fairly bland, Linux-geek-ified pages which completely fail to excite or inspire me. If you're trying to compete with Apple and M$ you've got to have a better shop-window than these. Preaching to the converted? 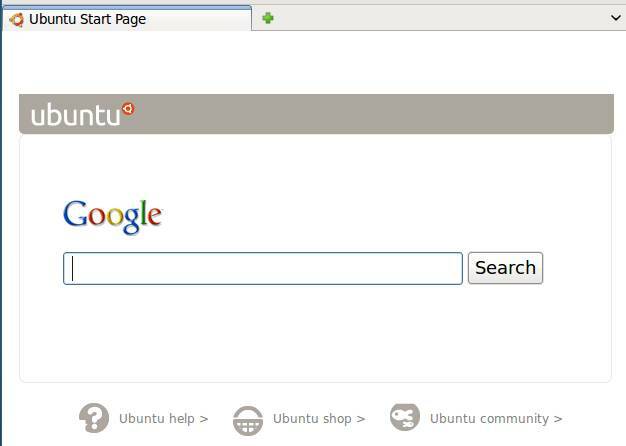 Ubuntu Help page makes no mention of Lucid 10.04 release (as of Sat 01 May midnight); why not? Now Ubuntu Shop takes you to the Canonical Store, which is not great if you are a new user who doesn't know or doesn't give a stuff who Canonical is, or that it's the company that releases Ubuntu. Worse than that, it's a bland merchandise page and doesn't even mention the Ubuntu Music store. Doh! Hello, Canonical, missed opportunity or what! My question; the colour scheme - why grey? Would the Lucid purple (aubergine?) not be more appropriate? I mean; grey???! !The roll-overs change colour to the old Ubuntu orange, which may be worse.